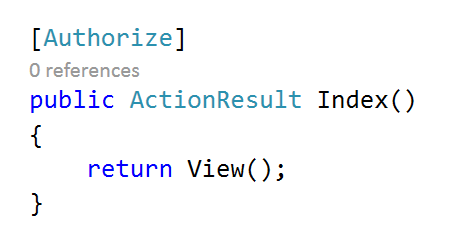 In ASP.NET MVC, Filters are used to inject logic at different levels of request processing and allow us to share logics across Controllers. For example, let’s say we want to run a security logic or a logging logic across the controller. To do so, we’ll write a filter containing those logics and enable them across all controllers. When we enable a filter across all controllers or actions, the filter enables the upcoming HTTP request. violation of the Single Responsibility Principles; actions will now perform additional tasks of logging. We can mitigate the problems above by putting the logging logics inside a custom action filter and applying the filter at all the controllers’ level. Have you ever come across source code as shown in the image below? [Authorize] is an Authorization filter, and it gets executed before any HTPP request or Action method execution. The Authorize filter is part of MVC, but if needed, we can create a custom filter too.